Harvey Norman Ireland Vouchers, Discount offers and Free Gifts in April 2019. Redeem a Harvey Norman Ireland Voucher from voucher-code.ie and get your benefit at harveynorman.ie. Never miss again a Harvey Norman Ireland voucher or sale offer! 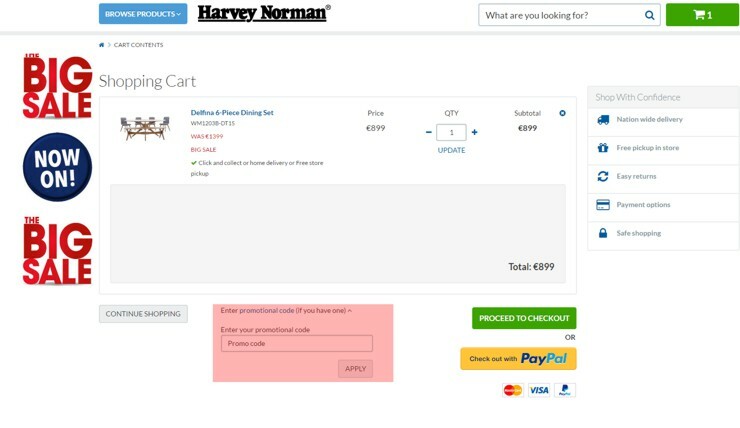 Please enter a Harvey Norman voucher code directly in the 'Enter your promotional code' box on the basket page and activate encashment by hitting the "APPLY" Button. Discounts will be applied only if the code is valid and meets the minimum value required. Harvey Norman is a leading retailer of furniture, bedding, electrical and computers and has 14 stores across the island of Ireland and 300 stores worldwide. The stores have over 700,000 square feet of retail showrooms and boast a massive range of goods for your home. Shop in-store or shop online, whatever suits you! Their energetic, positive and entrepreneurial spirit is reflected in their familiar slogan "Go Harvey, Go!". Customers know Harvey Norman as a retail destination providing excellent customer service, wide product ranges, reliable advice, competitive prices and generous credit terms. At Harvey Norman they believe value is key, but you should never have to compromise on quality and style; which is why they offer a wide range of products to suit all budgets and lifestyles. Harvey Norman are experts in technology, with not only great prices, but the latest and best in every category. In furniture and home furnishings their worldwide buying power ensures you get the best deal, the latest trends, and top quality. Their buying team strive to bring you the best the world has to offer in terms of style and value, including, where possible, locally made products. The business is powered by its people, and passion defines their commitment to meeting the needs of the customers. Purchasing, researching or planning a trip to one of the 14 stores is now easier than ever. They understand that their customers lead busy lives so they want to make sure your shopping experience is stress-free and convenient anytime, day or night. 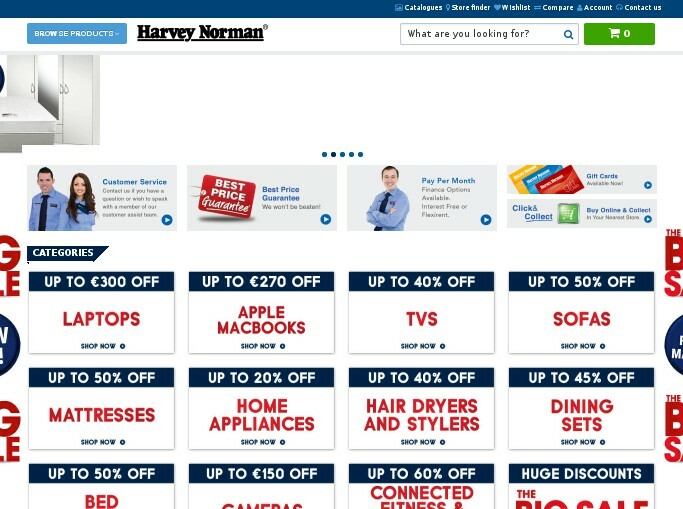 The website harveynorman.ie offers all of that and more; browse and buy from their extensive product range with a click of a button, and get it delivered straight to your door or pick it up from your nearest store. The Harvey Norman success story began in Australia as a single electrical appliance store opened by company chairman Gerry Harvey with retailer Ian Norman at the site of a former auction house in the Sydney suburb of Arncliffe in 1961. One of Australia’s most successful and well loved entrepreneurs, Gerry Harvey is a national business icon and is a much sought after commentator on business, economic and social issues. Gerry Harvey’s honest, down to earth, and direct approach underpins their successful culture and the way they do business. They’re a people business. Over the past 12 years, Harvey Norman has expanded its worldwide presence with stores in Malaysia, Singapore, Slovenia, New Zealand, Croatia and of course Ireland.